The new Silk Road is a Chinese initiative to expand trade across 68 countries throughout Asia, Eastern Europe, and Africa. Also known as "One Belt, One Road," the plan includes over $1 trillion in infrastructure investment across the region to bring the ancient Silk Road trading route back to life. China hopes the plan will strengthen its standing as a global leader. The profit potential is also massive for investors looking to benefit from China's trillion-dollar investment and expanded trading zone. Money Morning Chief Investment Strategist Keith Fitz-Gerald says this is a tremendous opportunity for investors, and it's one he's been following for years. "This is a $1.1 trillion attempt to remake the world in China's image," Fitz-Gerald told FOX Business Network on Monday. "The investor has a very limited window now that the story is out in the open," Fitz-Gerald said. China's "Belt and Road" initiative is designed bolster China as a world leader, but it's also opening new markets for Chinese companies. That could mean a profit windfall for investors who know where to look. This is an opportunity Fitz-Gerald has been tracking for years, but the media is just now starting to take it seriously. "China's ambitions are extraordinary and unprecedented." "99.9% of Westerners have been missing the boat, which means they'll also miss the greatest wealth-building opportunity in the history of mankind," said Fitz-Gerald. The new Silk Road, first announced in 2013, will connect China with markets in Eastern Europe and Africa through new infrastructure and trading routes. The investment in roads, bridges, tunnels, rail, and ports will make commerce between China and these countries easier and cheaper. With 68 countries involved in the initiative and trillions pouring in, China's new economic plan truly has massive scale. 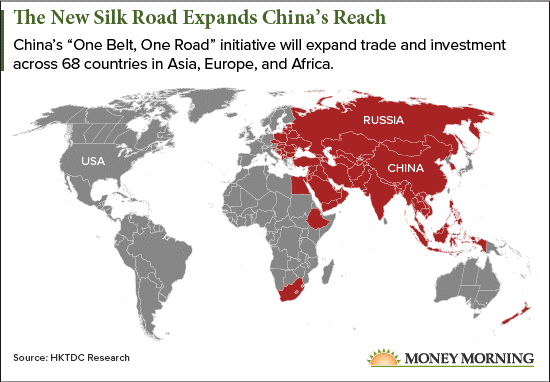 Just look at the One Belt, One Road map to see how large this trading group will be. But make no mistake: While the trillion-dollar investment to make this happen will be a boon to the economies on the route, the real winner is China. "[Chinese President Xi Jinping] hopes to create new markets for Chinese companies," reported The Economist earlier this week (May 15). "China needs it because it provides an answer of sorts to some of its economic problems." The new Silk Road is now underway. China has already spent billions on construction projects across the new Silk Road route, and this week China is hosting 28 world leaders participating in the project. The Belt and Road forum, as it's called, features the most world leaders in China since the Beijing Olympic Games in 2008. While China is turning its plans into action, investors need to move quickly to get exposure to China and take advantage of the potential economic boom. In fact, American firms like General Electric Co. (NYSE: GE) are already trying to get in on the action. GE is bidding to provide $7 billion worth of new equipment for Chinese construction companies working on the Belt and Road plan this year. GE says it has a "laser focus" on this opportunity. You should, too. "There's still time for you to make the key plays to harness the movement of China's money abroad," said Fitz-Gerald. And to help Money Morning readers take advantage of this massive effort by the Chinese to dominate the global economy, we're giving you our best new Silk Road investments. INDIA is not part of this initiative and shown in the map in the article.